All right, got that? Now, the previews I saw did make the book looked slightly like everyone would be a full-armored knight, the diversity of this book actually goes farther – tale Briathos Tassiel, first character and a purifier oracle of celestial blood may be groomed to be a hero by the Inheritor’s servants, but the incorruptible aasimar also makes for an interesting character in both his young age (at only 74 years) and his desire to reconnect with his celestial heritage. 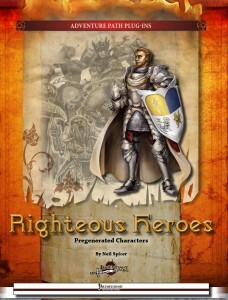 Caric Solnebren, the oathbound human paladin is a dual-talented man from a rich background – and his brother, the Aroden worshiping Loric Solnebren, a disillusioned sanctified rogue, makes for a great sibling rivalry fanned further by the opposition between his doctrines of Aroden and the Inheritor’s code. And indeed, synergies like this are not a rarity – in the roleplaying tips and background information, a vast array of ideas is provided to make the dynamics of the group work from the get-go and provide further story hooks down the road – take Tessara Arthinest, the elven synthesist summoner with her fused celestial spirit of valor. Beyond being shielded from traumatic experiences by her eidolon (one can never be sure to whom one is talking to when addressing her!) without her knowledge (which makes for good roleplaying regarding the nature of free will), her eidolon also originates from the same celestial source that fathered Briathos Tassiel. It’s small secrets like that and their suggestions that make these characters be more than pregens – they can be considered a party from the very get-go! Emerina Vestelle, the tiefling infiltrator inquisitor of Desna makes for an unconventional hero – born among evil cults, she was rescued and properly raised and now is a sensual and flirtatious lady, an uncommon contender to bringing an end to the worldwound’s evil. Illemandir Ziruul, the menhir savant druid is a half-elf whose very birth was the result of the horrors bringing together two people that otherwise wouldn’t have met, making him a living proof that even the bleakest of happenstances can result in positive outcomes. His connection with the land, explained as owing his life to the mastery of ley lines also makes for a superb motivation to stem the tide of corruptions.